Without much extra distance you can also reach the Community of Invermere, Panorama Mountain Resort, or the resort community of Fairmont Hot Springs. Drive an hour further south and you'll be in the small Bavarian themed City of Kimberley, an ideal destination for a long weekend or school holiday. 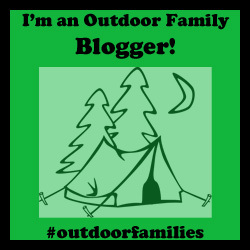 I've organized this guide by town, community, or resort area starting in the north and working my way south through the Columbia Valley. This is one area of the Columbia Valley that we are just beginning to explore and I will be writing more soon. 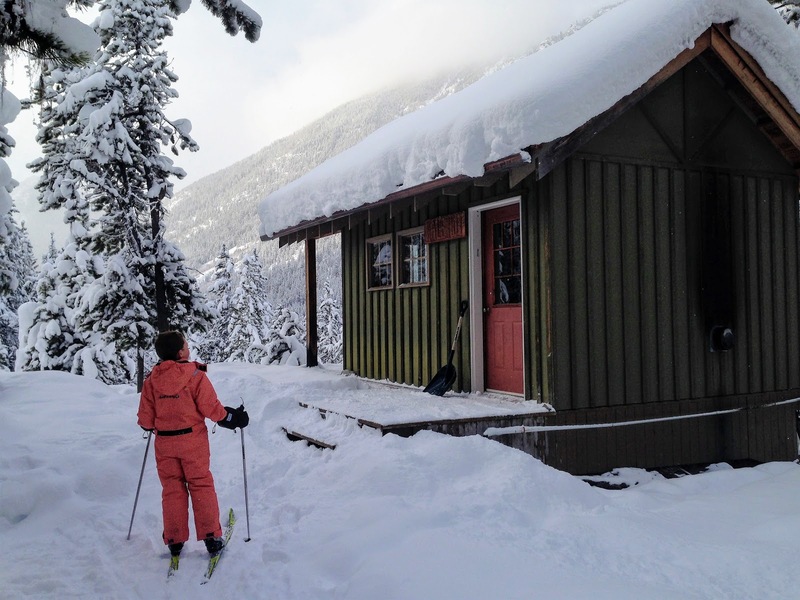 Enjoy cross-country skiing at Dawn Mountain Nordic Centre (with 35 km groomed for classic and skate skiing) - and the centre is located less than a kilometre from the base of Kicking Horse. Go for a winter hike or snowshoe around the Cedar Lake area. There are four different lakes to explore here. For more information please visit the Tourism Golden website. And here you'll find more information on accommodations. There are plenty of affordable options including hostels, guest houses, and B&Bs. We spend a few nights here every year for New Years and frequently come out for the Family Day long weekend in February as well. 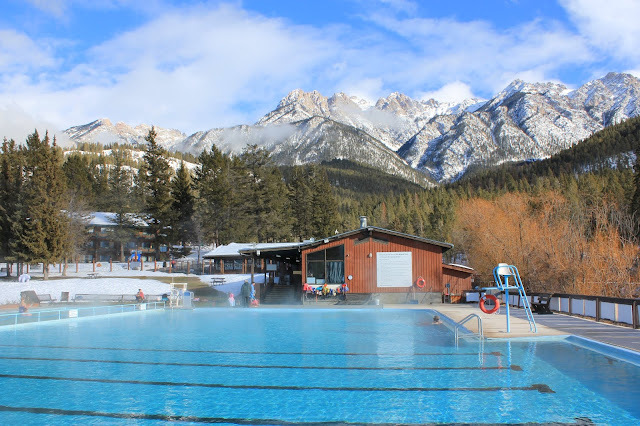 Visit the Radium Hot Springs Pool (of course!) There's also a heated swimming pool for the kids. Hike the Juniper Trail if it's not too icy (or if you have ice cleats/spikes.) 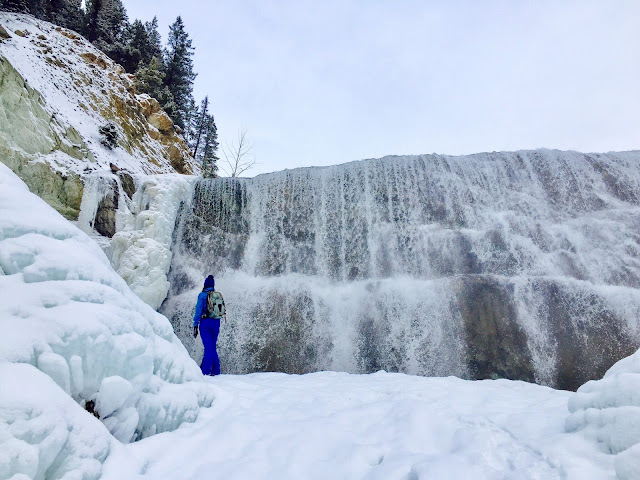 We also like checking out the frozen waterfall down in Sinclair Canyon off this trail. Take a day trip to Nipika Mountain Resort Invermere, Panorama Mountain Resort, or Fairmont Hot Springs. The beauty of staying in Radium Hot Springs is that you're at the centre of everything. You could even go skiing in Kimberley or Golden for the day. 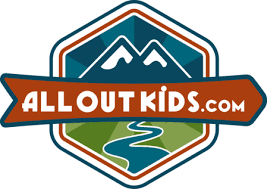 Use Radium as your base camp for adventure across the entire Columbia Valley. For more information, visit the Tourism Radium Hot Springs website. For accommodations, consider renting a condo from Airbnb or Owner Direct. There are many condos in this village and it allows you to cook your own meals. 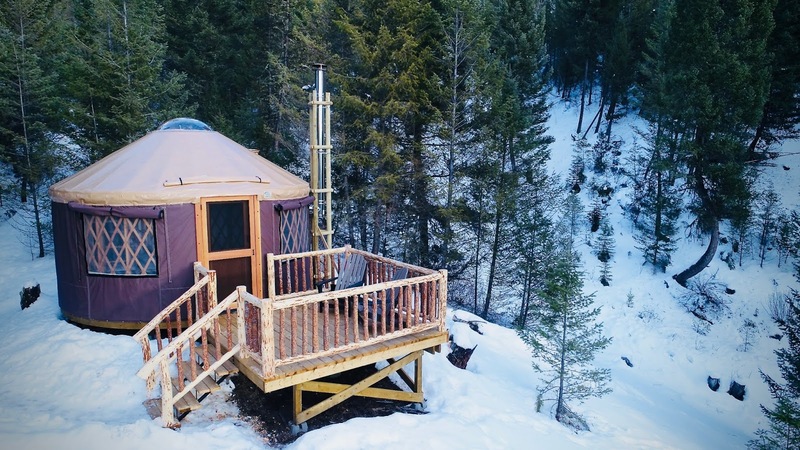 Nipika Mountain Resort is an eco-resort is located approximately 45 minutes outside Radium Hot Springs. Here you'll find over 50 km of groomed ski trails and 25 km of dedicated fat bike trails (groomed to perfection) along with snowshoe trails as well. Stay overnight and you can ski, snowshoe, or bike out the front door of your own cozy cabin. There's even a small pond on site for ice skating. Visiting Nipika is always one of our winter highlights, and there's no other place I like fat biking more. 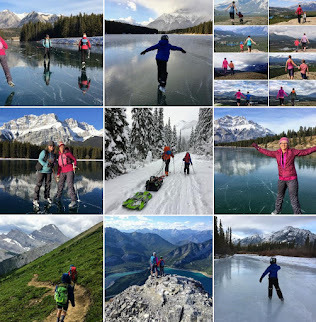 The biggest highlight here is skating on the Lake Windermere Whiteway between the towns of Invermere and Windermere on the world’s longest ice-skating path. The full track is 34 km long when the lake is fully frozen, and the Whiteway promotes community spirit as the entire valley gathers in the same location to skate or ski around the lake, with dedicated paths for both cross-country skiing and ice skating. Local cyclists also like riding around the lake on fat bikes with studded tires, and the snowmobile community is out in force as well, using the middle of the lake as their recreational ground. 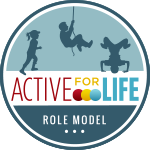 A $5 donation fee is requested from all Whiteway users (or a seasons pass can be purchased for locals) to support the efforts of the Toby Creek Nordic Ski Club who maintains the Whiteway. And you can watch a fabulous video of the experience here on the Columbia Valley website. For up to date conditions on the Whiteway, visit the Toby Creek Nordic Ski Club website. Most people will be completely satisfied with the Lake Windermere Whiteway, but if you want a smaller lake to skate or ski on, Lake Lillian also gets groomed and tracked for skiing (and sometimes for ice-skating) by the Toby Creek Nordic Ski Club. It's located on the road up to Panorama and is only 10 minutes outside town. More information on Lake Lillian can be found on the Toby Creek Nordic Ski Club site. Note that as with the Lake Windermere Whiteway, a $5 donation is requested per user for use of the Lake Lillian Whiteway. I love ski or hike in/out locations, and this is a prime contender for one of the best spots to enjoy a variety of winter sports without ever having to drive anywhere. Walk out the door of your cozy condo in the Panorama Village and enjoy downhill skiing, cross-country skiing, snowshoeing, or fat biking – with rentals for all sports on site. With the amount of options here, you might just have to stay for a week! Panorama Mountain Resort is a short 20 minute drive if you are staying in Invermere as well and we usually visit this resort as a day trip from Radium to go cross country skiing over New Years. Rent a condo in the village and you'll enjoy relaxing at the end of each day in the Panorama Springs Hot Pools, included with all stays in the Panorama Village. We love the pools at the Fairmont Hot Springs Resort. I like to soak in the hot pool while my boys swim and play around in the warm pool (situated side by side so I can keep an eye on them while I’m relaxing.) In the summer there’s also a dive tank with high and low board. In the winter, this small pool is still open (minus the boards) and it’s a great way to cool off after you’ve been in the hot pool too long. Deadline for purchasing H2O cards is December 24th. Finally, Fairmont Hot Springs is a lovely family-friendly resort and I highly recommend spending a weekend here at the lodge. Hike to Findlay Falls near the Village of Canal Flats - A high clearance AWD or 4WD vehicle may be needed if it's recently snowed. You'll also want snowshoes if the trail hasn't been packed down. 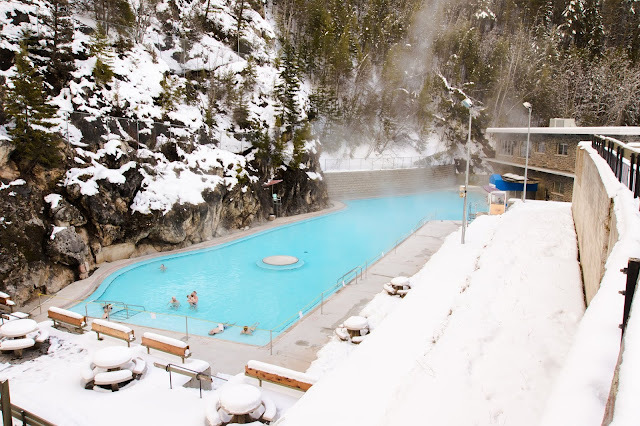 Visit Lussier Hot Springs, natural hot spring pools located near Canal Flats. They are accessed via a rough logging road followed by a short hike. - You may want an AWD or 4WD vehicle in the winter and snow tires would be very helpful. Explore the Spirit Trail, an old historic road that connects Fairmont with Canal Flats. Hike as far as you want and return the same way. 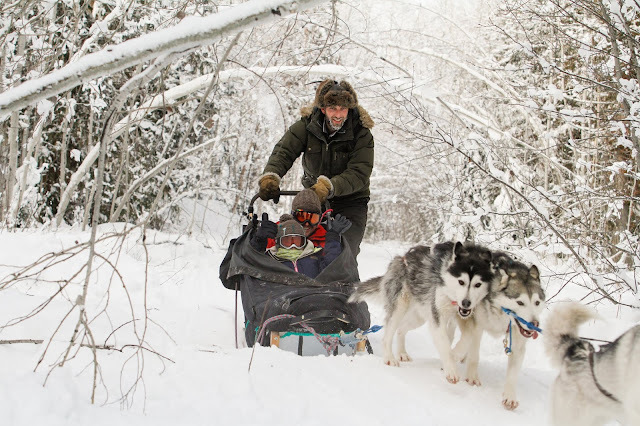 Snowshoes may be necessary but chances are you should be fine in winter boots for this trail. Take a walk on the new Markin MacPhail Westside Legacy Trail which will connect Invermere and Fairmont when completed. The first 5 segments have been completed from the Invermere side and you'll find the trail off Westside Road. Kimberley is one of my favourite mountain towns with a quaint Bavarian themed plaza located downtown. Go cross-country skiing or snowshoeing in the Kimberley Nature Park, a large natural area located completely inside city limits and containing more than 30 miles of trails for skiing, hiking, or snowshoeing. It's also the largest municipal park in all of BC. Spend the day downhill skiing at the Kimberley Alpine Resort. And I highly recommend staying at one of the ski in/ski out condos on the property where you'll be close to both the alpine resort and the nordic centre up above. Go cross-country skiing at the Kimberley Nordic Centre, just up the road from the Alpine Resort. The Nordic Centre has 30 km of groomed trails and the Kimberley Nature Park is also accessible from this centre for backcountry touring or snowshoeing. Note that there are trail fees to ski at the Nordic Centre. 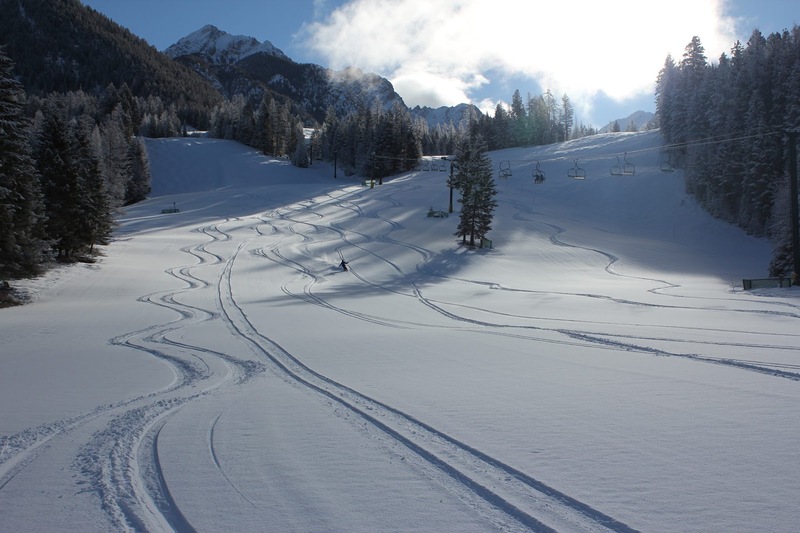 Join a fat bike or snowshoe tour at the Kimberley Alpine Resort. The Trickle Creek Snowshoe Tour is family-friendly and you'll enjoy a hot drink and s'mores on your outing. There's also a Kootenay Haus Chocolate Fondue and Snowshoe Tour where you'll ride up the chairlift for a gentle snowshoe tour up top followed by chocolate fondue. Plan at least one dinner in the downtown Platzl. My personal favourite restaurant is the Pedal and Tap where I’m obsessed with their Vietnamese pulled pork subs with mucked-up fries. My son is a huge fan of their spaghetti balls and I have been known to plan ski trips to Kimberley around our family’s love of this restaurant. Tip: Dine early because I’m not the only one who loves this restaurant, and the dining room is small. I really need to get back to Kimberly. I only seem to visit there in summer, but want to change that! It's so magical in winter and the ski hill is very family-friendly. We are the opposite from you and never seem to get there in summer. We really need to go check out the bike trails.